In her Manhattan apartment, designer Amanda Nisbet lacquered the walls of the library with a custom-mixed green (based on Benjamin Moore’s Forest Moss). She used the same color to spruce up the desk and chair set, coating the red leather desktop with green paint and swapping the chair’s red leather for a nailhead edged chartreuse Edelman leather on the front and a Clarence House gray velvet on the back. Above the desk hang three black-and-white photos from the Staley-Wise Gallery: A portrait of Mick Jagger by David Montgomery; a photograph of Yves Saint Laurent kissing Francoise de la Renta by Jerry Schatzberg; and a shot of the model Varuschka by Bert Stern. Nisbet used more smoky gray tones throughout the room to ground the vibrancy of the wall paint. The sofa is upholstered in the same gray Clarence House velvet as the desk chair. 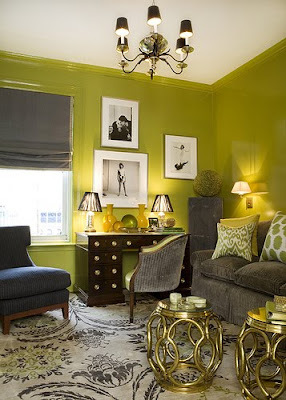 The green throw pillows are from Madeleine Weinrib. The small tables are 1940s French and come from an old hotel in Paris. Made of brass and glass, they help open up the room; Nisbet said a coffee table would be too imposing in the tight space (the room is 10′ by 12′).